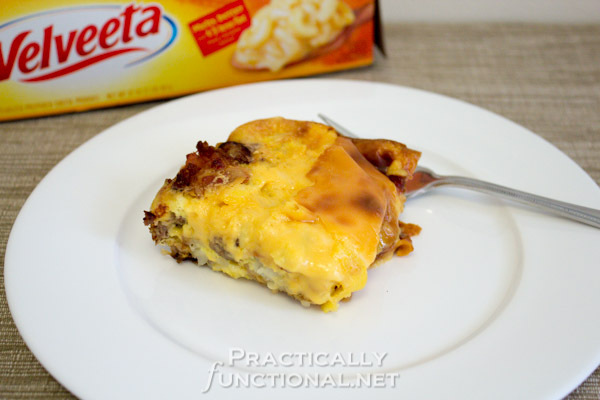 Velveeta Recipe: Meat Lover's Cheesy Potato Breakfast Casserole! 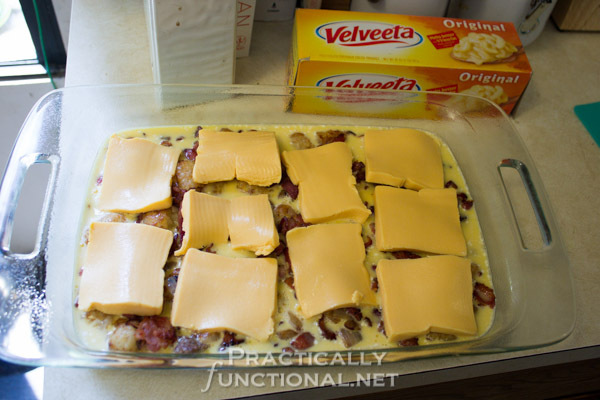 Home > Recipes > Main Dishes > Velveeta Recipe: Meat Lover’s Cheesy Potato Breakfast Casserole! I am a member of the Collective Bias® Social Fabric® Community and I had the opportunity to be part of a social shopper insights study for Collective Bias and their client. 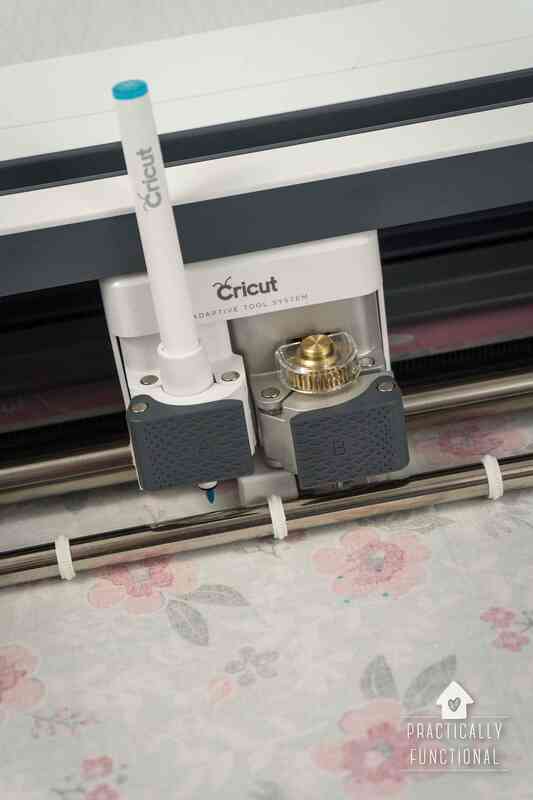 I was compensated to participate in this shop, but as always, all opinions are 100% my own! You know that I only publish sponsored content for companies or brands I believe in and for products I love! If you love breakfast, breakfast meats, and Velveeta cheese, then this Meat Lover’s Cheesy Potato Breakfast Casserole recipe is for you! My favorite Velveeta recipe is actually a chili cheese dip, cuz what better way to use melted cheese than as a dip for chips?! But just because Velveeta is perfect for dips doesn’t mean it isn’t great in tons of other things too! 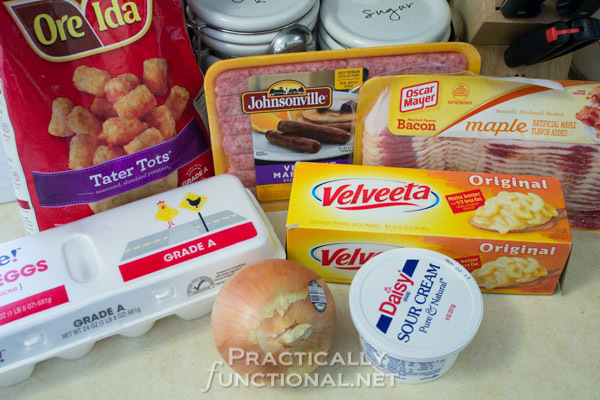 So today I’m sharing a cheesy breakfast casserole recipe with you guys! NOTE: It’s pretty easy to make substitutions in this recipe! You can add some bell peppers or mushrooms or any other “saute-able” veggie in place of the meat, or in addition to it! Start by preheating your oven to 325 degrees. Then chop your bacon into bite-sized pieces and fry it in a pan until it just starts to get crispy. 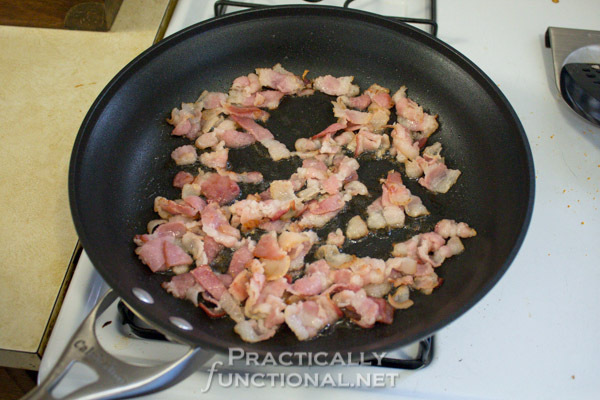 Once the bacon is done, remove it from the pan, but leave the grease. 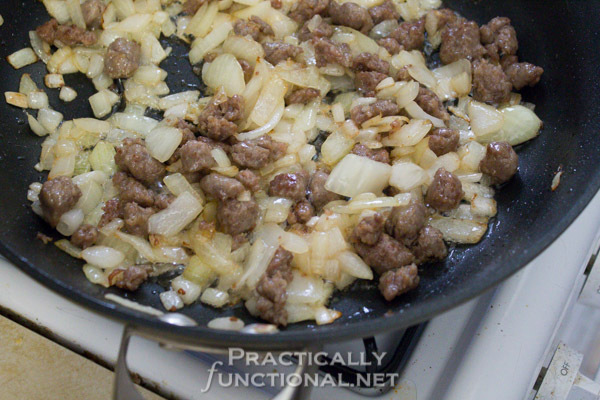 Chop the onion and add it to the pan, then crumble the breakfast sausages and add them to the pan as well. Saute until the onions are tender and just starting to turn brown. Spray a 9×13 baking dish with cooking spray, and then spread out the potatoes, sausage, and onion into the bottom of the dish. Sprinkle the bacon pieces over the top. 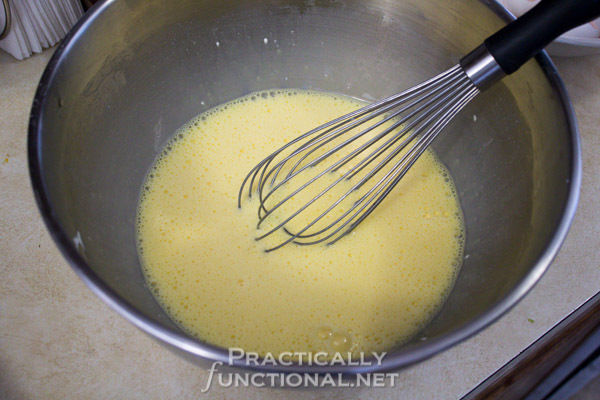 In a mixing bowl, whisk together the eggs and sour cream until smooth. Then slice up the Velveeta cheese into about 10 pieces. Layer the cheese over the top of the casserole, and then pour the egg/sour cream mixture over the whole thing, making sure it settles down into all the nooks and crannies at the bottom! Put the whole thing in the oven and cook for about 45 minutes. Check when you get near the end; you want the cheese to melt and just start to turn brown, but you don’t want it to burn! When it’s done, pull it out of the oven, serve it up, and enjoy! The casserole reheats well too, so don’t worry if you don’t finish it all in one sitting! What are some of your favorite Velveeta recipes? Check out the Velveeta Facebook page for tons of great recipe ideas if you need some inspiration! 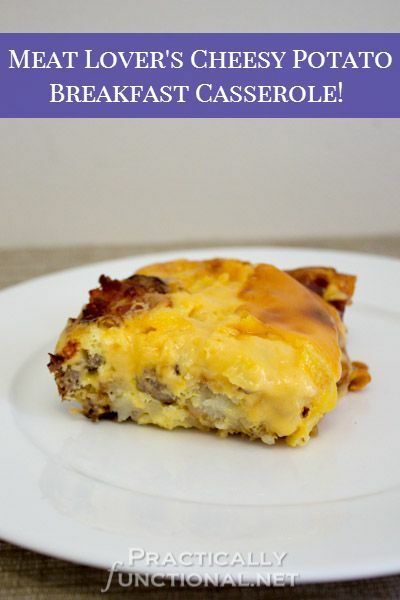 Meat Lover’s Cheesy Potato Breakfast Casserole! If you love breakfast, breakfast meats, and Velveeta cheese, then this Meat Lover's Cheesy Potato Breakfast Casserole recipe is for you! Chop your bacon into bite-sized pieces and fry it in a pan until it just starts to get crispy. Remove the bacon from the pan, but leave the grease. Chop the onion and add it to the pan. 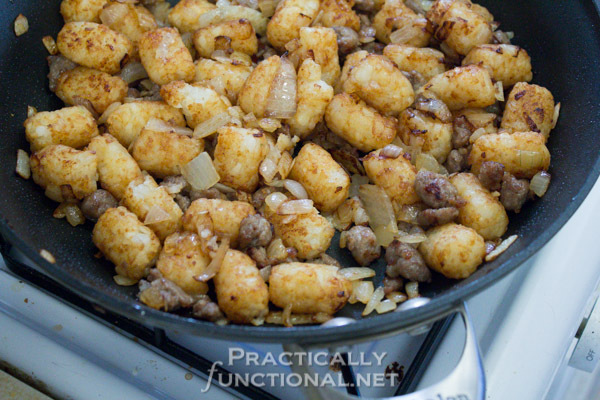 Crumble the breakfast sausages and add them to the pan as well. Saute until the onions are tender and just starting to turn brown. Add the tater tots to the pan and continue cooking until the tater tots get a little bit crispy and just start to brown on the outsides. Spray a 9x13 baking dish with cooking spray, and then spread out the potatoes, sausage, and onion into the bottom of the dish. Sprinkle the bacon pieces over the top. 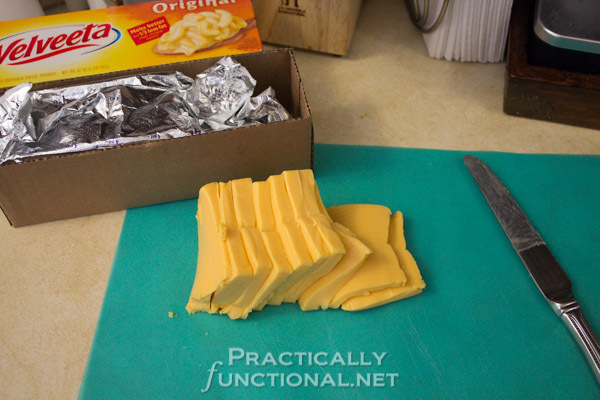 Slice up the Velveeta cheese into about 10 pieces. Put the whole thing in the oven and cook for about 45 minutes. Check when you get near the end; you want the cheese to melt and just start to turn brown, but you don't want it to burn! 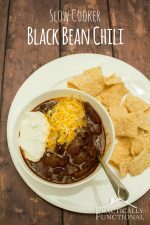 It's pretty easy to make substitutions in this recipe! You can add some bell peppers or mushrooms or any other "saute-able" veggie in place of the meat, or in addition to it! The casserole reheats well too, so don't worry if you don't finish it all in one sitting! 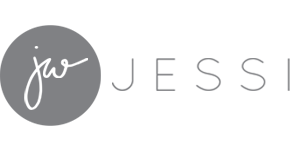 Disclosure: I am a member of the Collective Bias® Social Fabric® Community and I had the opportunity to be part of a social shopper insights study for Collective Bias and their client. I was compensated to participate in this shop, but as always, all opinions are 100% my own! « Summer 2013 Home Showcase: 26 Home Tours! Yum!!!! I love cheese this looks so good! Off to PIN! This looks so amazing. I am having company next week and definitely think I need to make this for us all. Pinning right now. Dang girl you’ve got me craving breakfast at 7pm! This looks amazing! Looks so good!!! 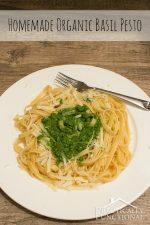 You did a great job with this and now I need to hit up the grocery store to get these ingredients! YUM!!! This is officially going on our breakfast menu for next weekend when the in-laws come to stay! It looks hearty, delicious, and like something they would absolutely love! Thank you so much for sharing! MMMM Bacon! Kidding (sorta)! This looks really great! Thanks for sharing! Wow! This looks absolutely delish! Not usually a fan of velvetta…but this? Looks amazing! I have never made a breakfast casserole, but this looks great! This looks so great! It would be so much easier than trying to make a huge breakfast for everyone. Sounds wonderful! 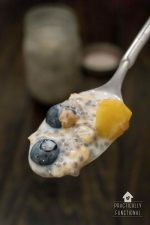 I am going to be having overnight guests and this would be the perfect recipe to make! Thanks for sharing with my new link party. I’m sure this will be a big hit! 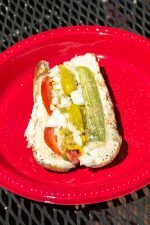 Hello, I have been trying to find a recipe like this for awhile. Someone I knew use to make a similar dish. Thanks for sharing , I’m glad I found you!